Photograph of marching German infantry. "XY795850 | Watch your credit | International News Photo | Slug (German infantry) | Gocsestepping into Austria | Munich, Germany... More than 100,000 Germany infantry-men like those shown on the march here are plodding over Austrian roads today, according to reports from the frontier. Official announcements from Berlin admitted that German troops had crossed the Austrian border, sent, said the announcement, in response of the urgent plea of Arthur Seyss-Inquart, new Austrian Chancellor. To prevent bloodshed, Great Britain and France sent vigorous protests on this "armed invasion". w.3-12-38-11.30 | See wire story" -- typed note attached to verso. "Received. Examiner reference library. 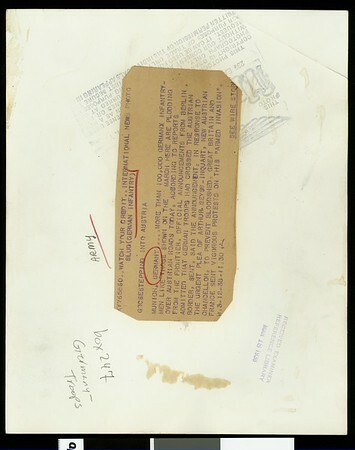 Mar 18, 1938" -- stamped on verso.